We love mustard. Perhaps it's because we like spicy foods, but we don't like the pain that comes with eating jalapeños, red pepper flakes, or other hot ingredients. 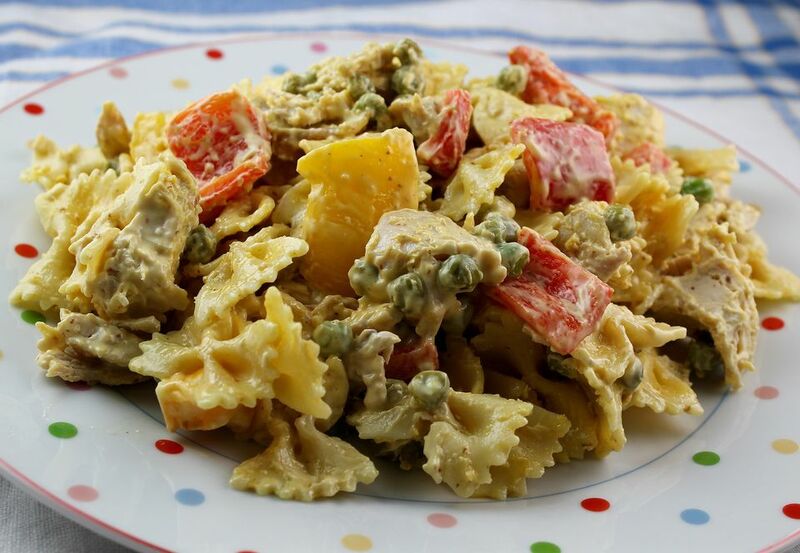 So this mustard chicken pasta salad is a dream come true. The dressing is made from four (count 'em, four) kinds of mustard. It envelops tender pasta, chicken, and veggies and makes a wonderful lunch or dinner. You could add more mustard if you'd like! We found a fabulous fire roasted garlic honey mustard that is perfect in this recipe. To get the chicken for this pasta salad recipe, you can do several things. You can buy a couple of rotisserie chickens from the supermarket and remove and cube the meat. This is our favorite way since they manage to get the chicken so tender, and we don't have to worry about Salmonella chicken in our kitchen. You can cook a whole chicken yourself, either by roasting it, poaching it, or grilling it, then remove the meat. Or you can cook boneless skinless chicken breasts, or cube raw chicken and saute it in butter until done. You can use any veggies you'd like in this salad. We myself prefer bell peppers of various colors and frozen peas. But sliced zucchini, summer squash, asparagus, green beans, or mushrooms would all be delicious. Enjoy this salad on your porch with a glass of white wine. All you need to add is some fresh fruit, which can double as a side dish and dessert, especially if you drizzle it with honey. Yum. In​ a large bowl, combine mayonnaise, yogurt, honey mustard salad dressing, Dijon mustard, honey mustard, horseradish mustard, and lemon juice. Mix with a wire whisk until blended. Bring a large pot of water to a boil. Cook the pasta until al dente. Meanwhile, prepare chicken and bell peppers. Add them to the bowl with the dressing and mix. Place the peas in a colander. When the pasta is done, drain over the peas to thaw them. Add to the dressing and mix gently but thoroughly until combined. Cover salad and chill for 1 to 2 hours before serving.